How a Table Booking Platform is creating space for itself with FoodPanda and Zomato already in Food Market? Food writer and TV host Vir Sanghvi and hospitality veteran Sue Reitz founded their online restaurant reservation platform EazyDiner in November 2014that offers reviews, recommendations, dining concierge services and deals with every reservation to the users. The service delivery is both over phone and online. 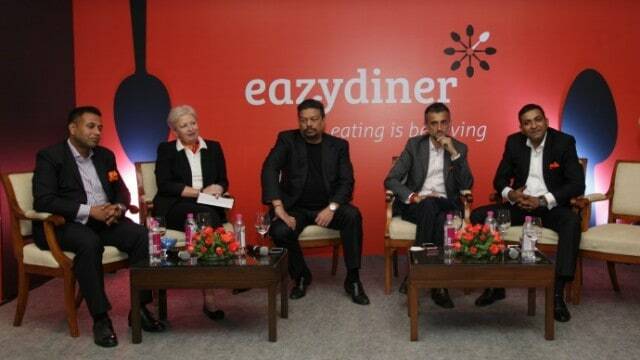 EazyDiner Co-Founder Vir Sanghvi said “We see the restaurant space and eating out space exploding in India. So we felt that there are opportunities in the area and what we are offering is a bouquet of services. At a simplest level, it is a restaurant reservation site”. EazyDiner is currently focused on curated content and offering real-time restaurant reservations, which is unique in its type. Besides services available over the internet and phone, its Android app is already live and the firm expects to launch its iOS app next month. Why we choose Eazydiner as Startup of the Week? Eazydiner in just 2 months has increased its popularity in the industry which could be seen from the seed funding that it raised from DSG Consumer Partners MD Deepak Shahdadpuri and ChrysCapital ex-MD Gulpreet Kohli. Within a short span of just one and a half months, the platform has dining options available with over 8,000 restaurants, 200 bars, and 300 of the restaurants giving special deals for reservations made from it. The expansion of the brand in Mumbai is expected by July 1, 2015 with complete listing details of over 7500 restaurants in addition to 500 partner restaurants with online reservations and exclusive deals and in Bangalore by the end of the year following Hyderabad, Pune, Chennai and Kolkata. Further the company aims to be present all over India. Also the company has raised $1 million for its expansion in Mumbai and Bangalore. Eazydiner has seen traffic targeting towards its social media platforms with a count of 11000+ fans on Facebook and 462+ followers on Twitter tries to engage the people through the lucrative deals and posts. What the investors tell about the technology platform? Currently the company works with two key sources for revenue. One is that F&B outlets pay EazyDiner a fee for every diner that gets book with the company, and secondly F&B brands advertise on the company’s platform. Other than the expansion planning across the country, Eazydiner is planning for another round of funding. Shahdadpuri, MD of DSG group said: “They will again invest in second round of funding to the company by the end of this year to make Eazydiner a brand name. The company has several big names associated with it in its advisory board including Oberoi Group’s Joint MD and CEO Vikram Oberoi, Leela Palace Hotels & Resorts Co-Chairman and MD Dinesh Nair, Dabur India Vice Chairman Amit Burman, Massive Restaurant’s Founder and MD Zorawar Kalra, Chef Gaggan Anand, and regional Vice President, South Asia,Starwood Hotels and Resort’s Dilip Puri. [su_box title=”More From DSIM Blog :- ” box_color=”#c7c7c7″ title_color=”#000000″]1) How Fashion and You lost its No.1 position in Indian fashion e-commerce industry?